I finally made it back to Hogwarts, but as a flunky, I guess. See, I have read Harry Potter and the Sorcerer’s Stone before. That would have been around 2004 or 2005. But I was in such a funk at the time and I think I had trouble grasping the story. When the Chamber of Secrets came up on my to-read list, I was trying to remember the Sorcerer’s Stone and I couldn’t. So, I decided to reread the Sorcerer’s Stone before starting the Chamber of Secrets. 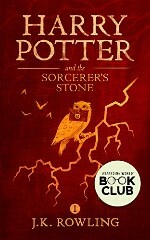 Harry Potter and the Sorcerer’s Stone is the first book in J.K. Rowling‘s Harry Potter series. Harry’s parents died when he was a year old and he lives with his aunt and uncle who are cruel to him. When he reaches the right age, he enrolls in Hogwarts School of Witchcraft and Wizardry. At Hogwarts, Harry is happy, but is he safe? Now that I’ve written something about the Sorcerer’s Stone, I can start the Chamber of Secrets.